Enroll in Duo two-factor authentication today. Visit duo.rowan.edu. Duo is a two-factor authentication service that adds an extra layer of security to your Rowan Network account. You may already be using two-factor authentication in your personal life to verify your identity through a text message or email when logging in to your bank account. Now, this extra protection is available at Rowan too. During the spring 2019 semester, all Rowan University students and employees who aren't enrolled in Duo will be required to sign up when they change their password. For answers to frequently asked questions about Duo, see below. It only takes three steps to enroll in Duo two-factor authentication at Rowan University. All students and employees are required to enroll in Duo Two-Factor Authentication before changing their password or accessing their account for the first time. Visit https://duo.rowan.edu/ and log in to the Duo Portal using your Rowan Network username and password. If your Rowan Network password has expired, click the My Rowan Network password has expired link under "Alternative Login Options" to confirm your identity and access to the Duo Portal. If you are new to Rowan, select I don't know my Rowan Network Username/Password under "Alternative Login Options" to confirm your identity and access to the Duo Portal. Once you log in to the Duo Portal you'll be prompted to create a six-digit Portal Security PIN. Enter a six-digit number you can easily remember. Don't forget your PIN! This six-digit number is your key to the Duo Portal. With your Portal Security PIN, you can log in to the Duo Portal and get a bypass code that'll give you temporary access to your account in the event the device you use for Duo is lost or stolen. We recommend using your smartphone with the Duo app. Most people find using the app on their smartphone — either to receive a "push" notification or to generate a passcode — to be the most convenient way to use Duo. Note: A screen lock must be enabled on your smartphone before you can use the Duo Mobile app. I'm Enrolled in Duo. What Do I Do Now? Once you have set a Portal Security PIN and registered a device to use with Duo, you will be presented with a Duo prompt when logging in to certain protected Rowan applications and websites. You'll see the prompt after you enter your Rowan Network username and password. Use one of your registered Duo devices to verify your identity when you receive the prompt, and you'll then gain access. 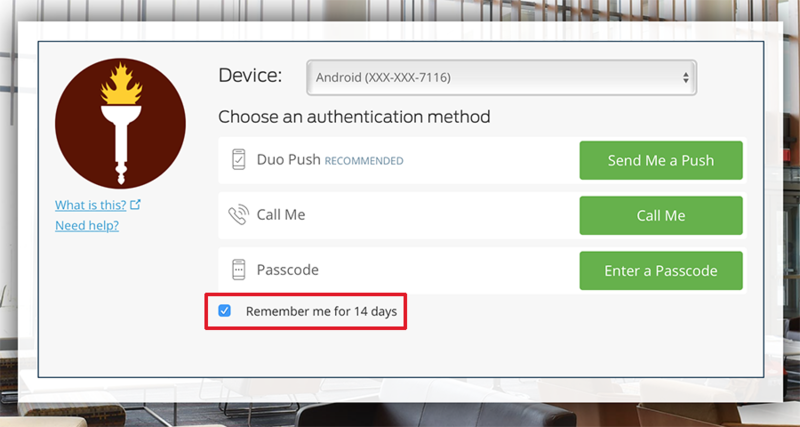 Most users can check the "Remember me for 14 days" box in the Duo login prompt on a trusted computer to bypass Duo in that specific internet browser for 14 days. If you use a different internet browser or switch computers, you will be prompted again by Duo. Note: EMR or CB users accessing Citrix through applications.rowan.edu will only be able to remember their login for 1 day. You'll use the Duo Portal to manage devices you have enrolled in Duo. You can remove phone numbers and tokens you no longer use or devices that have been lost, broken or stolen on the Duo Portal. You can also update an enrolled smartphone if you replace it with a new one but keep the same phone number. Where Can I Get Duo Help? What do I do if my Duo device is lost, stolen, broken or otherwise unavailable? Should I enroll more than one device? What is a Duo Hardware Token and how do I get one? Hardware Token Error "Incorrect passcode. Please try again"
How do I switch between multiple enrolled devices? What do I do if I have forgotten my Portal Security PIN? How do I unlock my Duo account? Can I remove myself from two-factor authentication after enrolling? Is enrolling in Duo two-factor authentication mandatory? I am reluctant to enroll my personal device in Duo. Do I have other options? Once enrolled, when will I be prompted to use Duo for two-factor authentication? Will I be prompted by Duo everytime I log in? Note: EMR or CB users accessing Citrix through applications.rowan.edu will only be able to remember their login for 1 day, not 14 days. Report an issue or make a request in the IRT Support Portal at support.rowan.edu.